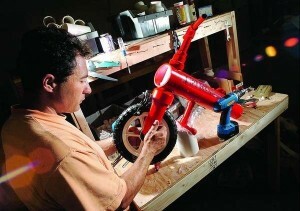 I’m Ed Mondello, the inventor of Glide Bikes, and I’d love to share my story of how I created Glide Bikes Balance bikes. In 2004, I took my 4-year-old daughter, Samantha, to buy a bike. After excitedly choosing a popular children’s bicycle, we rushed home to give it a try. The first two outings were disastrous: uneven sidewalks caused the bike to tip and fall over, and the bike was so heavy that she would become pinned underneath it, forcing me to rush over and extract her. It was painful to watch. With scraped knees and elbows, Samantha and I headed home in frustration. What should have been a fun and happy occasion had swiftly turned into a miserable experience. I began to think about what was causing the problem. I was convinced that the weight of the steel frame was hindering her ability to control the bike, and that the training wheels were delaying the learning process by preventing the feel of balance. Shortly after that, I saw a children’s Balance Bike at a bike show. Being an avid mountain biker, I instantly understood the concept: it taught children balance as the first step to riding a bike, not the last. Later that night, I began to look for a Balance Bike with solid design and durable construction. I couldn’t find a single one. Wooden Pedal less bikes were common in Europe. With that in mind, I set out to create one myself. I like to engineer things (having worked in the Robotics field outside of Boston), and, after experimenting with different designs, I was able to create the perfect Balance Bike. It incorporated patented slow speed geometry, as well as a low center of gravity, each of which helps children develop the confidence and balance that they need to transition to a larger bike. Today, I am proud to say that children around the world use my Glide Bikes balance bikes. We’ve also developed a model The Super Glider, which helps adults and children with special needs learn how to ride a bike. We continue to innovate and expand our line of pedal less bikes as well as transition into traditional pedal bikes. Look for future models coming soon.